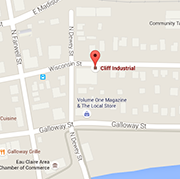 Cliff Industrial provides Northern Wisconsin and surrounding community with high quality machining services. Machined Replacement Parts – You can buy it, or we can make it! Have a need for replacement parts that are similar to one below, contact us! Give us your dimensions, material, and finish specifications for a free estimate. Typically our customers tell us that buying their part new would have costed them double to what we can make it for. Give us a try! Learn more about all of our services below. Or if you have a project you would like us to quote, contact us for a free estimate! Don’t forget to ask us about our FREE PICK UP AND DELIVERY OPTIONS!